All of us are busy. So busy that even with the best intentions, good food becomes too much of a challenge. You want to hit the farmer’s market but activities keep getting in the way. That’s why our farm offers FREE HOME DELIVERY. Delivery to wide areas around Peoria and Naperville. 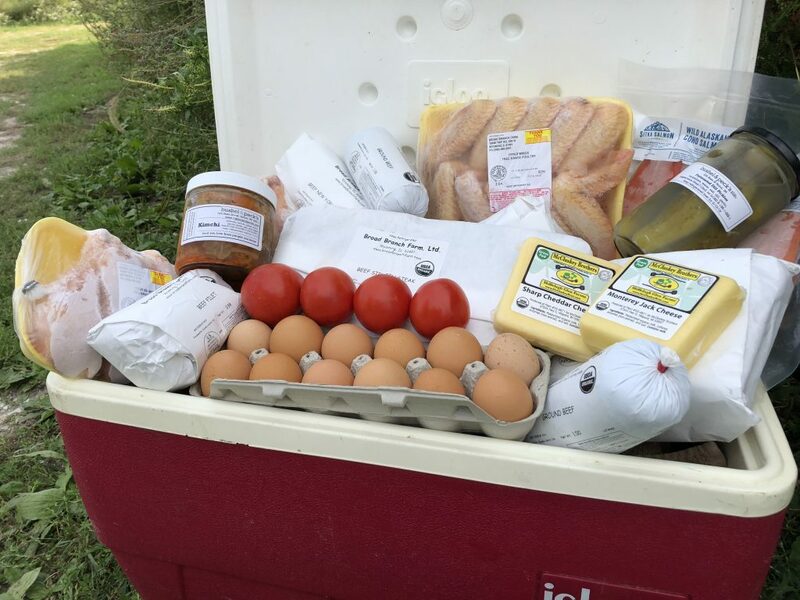 Shop Online and choose from BBF Meat, Eggs, Vegetables PLUS more outstanding food from producers we love. Our farm can deliver all the best right to your doorstep. Check out our next Home Delivery to your area. What Do You Home Deliver? Do You Have a Delivery Charge or Minimum Order? Minimum order is currently $25. Orders outside the delivery area require $100 minimum order. No! You do not have to be home for the delivery. IMPORTANT: You must leave a cooler to keep food cool in the summer and protected from freezing temperatures in the winter. Please use our Online Stores to order your items. You DO NOT have to create an account to order. Ordering creates an invoice only – no payment is collected with the initial order. Make sure you receive an AUTO CONFIRMATION for your order. If you do not receive a confirmation email, we may not have received your order. Online payment information will be mailed approximately 24 hours before delivery. When you checkout, you will receive a confirmation email with invoice only due to weight variations on meat items. IMPORTANT: If you do not see this automatic confirmation email listing what you ordered, we may not have received your order and you should contact us. Once your order is prepared and totaled, we will email you the final order with total price and a link to prepay. This email typically goes out the day before the scheduled delivery. Payment is with any major credit card. NO account is required to make payment. Home Delivery online payments will be charged a 3% online transaction fee which is what BBF is charged to take credit card payments. Do You Produce All the Food in Your Online Stores? In our quest to eat the best food possible, we have found other outstanding farms and businesses that offer food grown the way we want to eat – pastured, organic or pesticide free, responsibly harvested, family run and as local as possible. For example, Sitka Salmon offers responsibly harvested wild Alaskan Coho caught from small boats run by individuals and not corporations. We’ve found native Certified Organic Pecans from Missouri and Certified Organic family grown Walnuts and Extra Virgin Olive Oil from California. It’s a joy to connect with other farms and businesses doing it right. As a family and as a farm, we are committed to eating and offering the best food possible. Customers that live outside our delivery area can make arrangements to pick up at the farm, meet us at an agreeable location or have their order delivered for an additional fee. Please contact us! We’ll make it work! Want Home Delivery in Your Area? We are currently seeking additional Home Delivery areas. If you think your community is a possibility, please contact us.